With the 4 preset programs City, Sport, Sport + and Stock, the accelerator tuning is immediately ready for use. By pressing the plus and minus buttons, the driver can fine-tune each program. Background-lit multi-color LEDs show the selected fine-tuning. More than 20 different combinations are available. The CITY mode is perfectly designed for stop-and-go in urban traffic. It ensures an improved low-speed range with a response programmed for economic consumption. The SPORT mode increases the throttle acceleration already clearly and is suitable for most driving situations. The engine reacts more spontaneously: A real plus of dynamism, which the driver feels especially when overtaking. 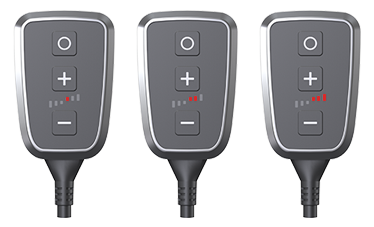 The SPORT+ mode has an optimized throttle response throughout the complete speed range. The response is designed for fast acceleration. The STOCK mode sets the vehicle’s throttle response in default setting. Choose from six levels to optimize the curve. You can increase the curve through 3 levels and reduced it through 3 levels. Do not change programs while accelerating. Press plus (+), in order to increase the response (up to three times). The display will move from right to left. Press minus (-) to reduce the response (up to three times). The display will move from left to right.